3:1 This is the lineage of Aaron and Moses at the time when the Lord spoke with Moses on Mount Sinai. 2 These are the names of the sons of Aaron: Nadab the firstborn, and Abihu, Eleazar, and Ithamar; 3 these are the names of the sons of Aaron, the anointed priests, whom he ordained to minister as priests. 4 Nadab and Abihu died before the Lord when they offered unholy fire before the Lord in the wilderness of Sinai, and they had no children. Eleazar and Ithamar served as priests in the lifetime of their father Aaron. 5 Then the Lord spoke to Moses, saying: 6 Bring the tribe of Levi near, and set them before Aaron the priest, so that they may assist him. 7 They shall perform duties for him and for the whole congregation in front of the tent of meeting, doing service at the tabernacle; 8 they shall be in charge of all the furnishings of the tent of meeting, and attend to the duties for the Israelites as they do service at the tabernacle. 9 You shall give the Levites to Aaron and his descendants; they are unreservedly given to him from among the Israelites. 10 But you shall make a register of Aaron and his descendants; it is they who shall attend to the priesthood, and any outsider who comes near shall be put to death. 11 Then the Lord spoke to Moses, saying: 12 I hereby accept the Levites from among the Israelites as substitutes for all the firstborn that open the womb among the Israelites. The Levites shall be mine, 13 for all the firstborn are mine; when I killed all the firstborn in the land of Egypt, I consecrated for my own all the firstborn in Israel, both human and animal; they shall be mine. I am the Lord. 6:11 See what large letters I make when I am writing in my own hand! 12 It is those who want to make a good showing in the flesh that try to compel you to be circumcised—only that they may not be persecuted for the cross of Christ. 13 Even the circumcised do not themselves obey the law, but they want you to be circumcised so that they may boast about your flesh. 14 May I never boast of anything except the cross of our Lord Jesus Christ, by which the world has been crucified to me, and I to the world. 15 For neither circumcision nor uncircumcision is anything; but a new creation is everything! 16 As for those who will follow this rule—peace be upon them, and mercy, and upon the Israel of God. 17 From now on, let no one make trouble for me; for I carry the marks of Jesus branded on my body. 18 May the grace of our Lord Jesus Christ be with your spirit, brothers and sisters. Amen. 17:1 Six days later, Jesus took with him Peter and James and his brother John and led them up a high mountain, by themselves. 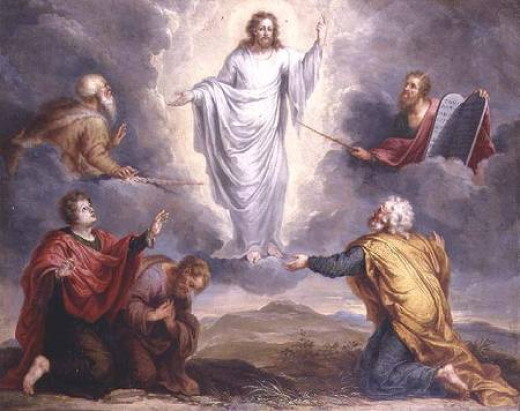 2 And he was transfigured before them, and his face shone like the sun, and his clothes became dazzling white. 3 Suddenly there appeared to them Moses and Elijah, talking with him. 4 Then Peter said to Jesus, “Lord, it is good for us to be here; if you wish, I will make three dwellings here, one for you, one for Moses, and one for Elijah.” 5 While he was still speaking, suddenly a bright cloud overshadowed them, and from the cloud a voice said, “This is my Son, the Beloved; with him I am well pleased; listen to him!” 6 When the disciples heard this, they fell to the ground and were overcome by fear. 7 But Jesus came and touched them, saying, “Get up and do not be afraid.” 8 And when they looked up, they saw no one except Jesus himself alone. 9 As they were coming down the mountain, Jesus ordered them, “Tell no one about the vision until after the Son of Man has been raised from the dead.” 10 And the disciples asked him, “Why, then, do the scribes say that Elijah must come first?” 11 He replied, “Elijah is indeed coming and will restore all things; 12 but I tell you that Elijah has already come, and they did not recognize him, but they did to him whatever they pleased. So also the Son of Man is about to suffer at their hands.” 13 Then the disciples understood that he was speaking to them about John the Baptist.